The USCutter MH Series Vinyl Cutter is a great entry-level cutter, perfect for hobbyists or small businesses. The kit comes with everything you need to get started except a computer. Straight out of the box, the sturdy cutter base was easy to assemble using only a screwdriver, and within 30 minutes I had cut my first set of stickers. The only issue I had during assembly was that the instructions are a bit vague, so make sure you look up USCutter’s video on YouTube. The video shows how to put the cutter together, ground it, hook it up to your computer, install the software and sets you up for your first cut. Getting the blade mounted in the holder was a little tricky, but after a few adjustments and correcting the pressure setting, this machine cut quickly and accurately. Simply feed the vinyl under the rollers and clamp down. The Vinylmaster software does an excellent job creating vectors and outlines but takes some instruction to get proficient. Thankfully, there are plenty of educational videos on the Internet. The software comes with hundreds of fonts and tools and I was able to install the drivers on Windows 10 Home with no problem. You can design your own image using a vector graphics program like Illustrator, or you can import an existing graphic using the software’s “trace” feature. I’m constantly impressed by its accuracy, from 2-inch square decals all the way up to 8-foot long projects. As an entry-level machine, there may be limits to the amount of detail this cutter can handle, but it easily handles my needs. This machine requires some babysitting when running big graphics, but this is typical for large jobs on any cutter. There is no delay from sending the job from your computer to the cutter. It’s almost faster than an old laser printer. 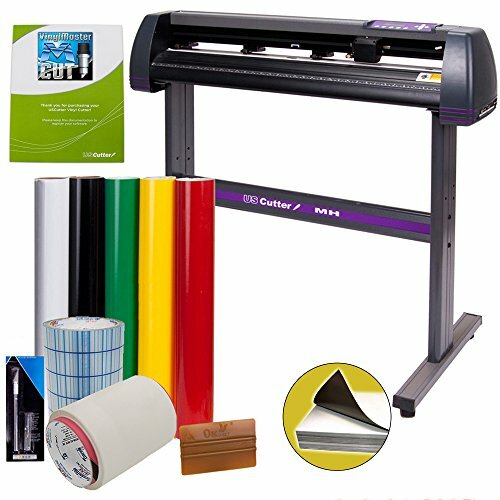 All in all, the USCutter MH Series Vinyl Cutter is a great product at a great price and has surpassed my expectations. I can see outgrowing this machine eventually, but for me, this will just continue to make money.